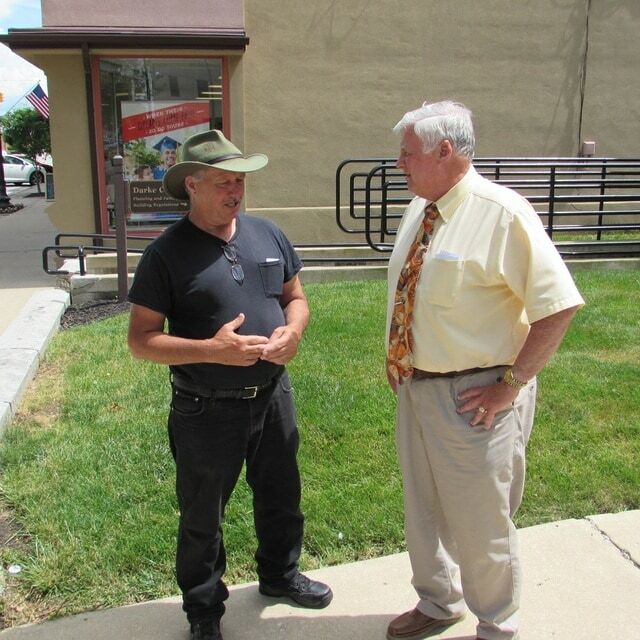 Steve Young (left) meets with Darke County Commissioner Mike Stegall in Greenville Monday. Young has walked more than 27,000 miles across the country in support of Victory Junction, a camp for children with serious medical needs. GREENVILLE – He’s traveled across most of the United States, accepting rides here and there, but mostly traveling on foot for more than 27,000 miles. Yet for Steve Young, 59, of Patrick Springs, Virginia, the cost of replacing shoe leather is more than offset by the awareness his walks brings to Victory Junction, a North Carolina camp for children with serious medical conditions. Young sometimes spend his nights in a tent, or occasionally a hotel room. The hot, humid conditions combined with the rainfall in Darke County led to an overnight stay at the Greeville Inn Sunday. In all, Young has visited 42 of the 50 states. On this trip, however, he will add four more to the tally – Colorado, North Dakota, South Dakota, and Utah. Walks to Alaska and Hawaii are not in his plans. Young arrived in Greenville from Urbana, via Ohio 36. He plans to head north along Ohio 127 to Van Wert, then westward into Indiana. No matter where he’s gone, Young said that virtually everyone he encounters has been friendly and helpful. “People everywhere have done amazing things for me,” he said. He related a story of how a church in Harmony, North Carolina, despite its small congregation, donated $1,231 to the camp after hosting him. The generosity also comes from law enforcement. He has a Facebook page set up by a pastor friend, and he will occasionally provide updates there on his travels. “There are a couple of sisters from Cullman, Alabama, who scold me when I don’t give them updates,” Young said, laughing. Young said this is likely his last walking tour. After returning home he will return to work at a regular job, but will also continue working on two books about his travels, which will emphasize the variety, kindness and generosity of people he has met along the way. For more information about Victory Junction, visit the camp’s website at www.VictoryJunction.org.